My friend recommended this product to me and I was intrigued but didn't run out to buy it because I've never tried BB creams before. I was at the drugstore one day and saw it on the shelf. I usually don't buy until I read reviews but I completely bought this on a whim based on how much my friend loved it. When I got home and read online reviews - I almost went back to the store to return it without even trying it. The reviews on Makeup Alley are terrible and from what I understood anyone with oily skin can completely forget about using this BB cream. My skin is mostly oily but gets somewhat dry in places especially in winter. My skin isn't a big issue - I have minimal scarring and spots, little redness, and an occasional break out here and there. Its very sensitive to new products so I was very iffy about trying something new. Something told me to give this a shot anyway. I applied it from the tube with my finger dotting it all over my face with a flat top buffer brush from Crown that was a little damp. The first thing I noticed was the scent - it was very strong but smelled Garnier products which I don't mind. Consistency seemed kind of like a thick moisturiser and not watery at all. On the first coat, my skin looked flawless. I applied a thin 2nd coat and I looked completely airbrushed with no caking whatsoever. My skin was evened out and it looked natural. I found this product very buildable and the coverage is fantastic for me (like I said before I don't need a lot). I also found it very light on my skin and very moisturising! I apply concealer under my eyes and set it all with a translucent loose powder from Marcell. Now here's where I am an exception to this product and oily skin. I wore this all day (to work, running, a nap, etc) and I was only the slightest bit greasy in my t zone but nothing extravagant. I usually always get oily after 8+ hours and have to blot/touch up no matter what kind of products I use. So, this oily skinned girl didn't have an issue with this product. When I wipe this off at night, I can see product coming off my face onto the cloth (I have used other products that are completely gone off my face before I wipe it off) so it did last all day for me. I'm not sure if its my powder that's keeping everything in place but it was still visibly on my face at 11:00PM. The colour of the light/medium matches my skintone perfectly. You get a lot of product in the bottle and I can imagine this will last me for a long time. The best part is my skin didn't mind this product at all! I've been using this for a good while and haven't gotten a single break out (I tried a tinted moisturiser and my face last year and I completely broke out everywhere)! I give this a 4 out of 5 because it was $20 at my drugstore. That's pretty pricey for a BB cream (the Revlon and L'Oreal were under $20 just as an example). My Revlon Colourstay Foundation isn't even that much so it was a bit on the expensive side for me. It also only comes in 2 colours so there is not much of a selection for the skintones in between light and dark and that could be a problem for other people. I've been wearing this on a daily basis to work and on the weekend and I am loving it. If I don't find another BB cream I love, I would definitely repurchase this when I run out. I hope girls with oily skin who are wondering about this product see my review and give it a try. 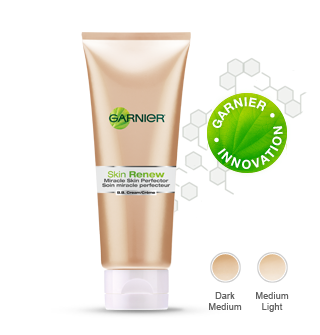 Great review - I love the Garnier BB too, but sadly it makes my skin break out! !